PHUKET: In a crucial Phuket Island Furniture League match, Patong and the Village faced each other at the ACG with both teams needing a win to boost their hopes of a showdown with title favorites, Laguna CC. Undefeated so far this season, the Village knew that taking points from Patong would effectively end the reigning champions expectations of at least making another final and place themselves in strong contention to become champions. Village support has been extraordinary all season, and this game again brought out the crowds whose vocal presence suggested that a portion of the ‘Barmy Army’ – England’s traveling cricket support faction – had left Dubai, where England are playing Pakistan, to take up temporary residence at the ACG. It certainly made for an interesting afternoon of cricket with Village players saluting their support in the clubhouse, on taking wickets, in styles reminiscent of modern day footballers celebrating a goal. Had the ground not been so dry, a few shirtless body-slides towards the pavilion may also have been witnessed. Having won the toss, the Village decided to take advantage of the cooler morning conditions and bat first. 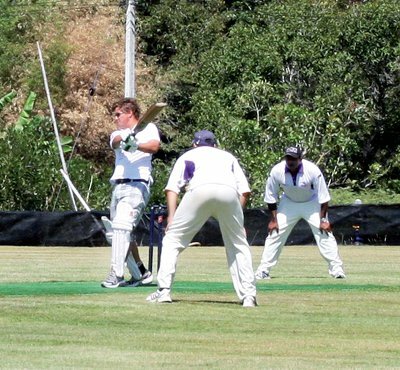 Kevin Quilty and Justin White opened for the Village, but Patong’s paceman, Anil Rawat sent a stump-shattering wake-up call to Quilty with his second delivery that sent alarm bells ringing throughout the Village side. Crucial to these games is lasting the 40 overs and Martin Foster, who next came to the crease, was determined to anchor the innings. His defensive tactics prevented any further loss, and with White (22), a partnership of 36 was forged. However, both batsmen were unable to advance the partnership or their score when a catch on the boundary by Patong’s captain Richard Folds, silenced the crowd who thought Foster’s (10) hike to square-leg off a Kishor Jhagta delivery was on its way for six. A few minutes later, White too was dismissed when Maneesh Sadarangani found a gap to bowl the opener with the score at 36 for 3. A brief visit by Paul Stamp yielded three runs before Joshi Naresh, returning after an extended absence, trapped him lbw. This brought Tim Ross into the fray and along with Diwan Mydeen, the pair added 58 to the score. Ross blasted his way to 42 off 40 balls before being caught by Folds, again in support of Jhagta’s bowling. Ross should have been dismissed earlier, but a fumbled catch at mid-on by Mike Khan allowed his innings to continue. Mydeen’s run was ended when he was on 16, caught by Naresh off a Seemant Raju delivery. With the score at 98 for 6, the game seemed to be in Patong’s hands. But like their dismal catching display, it soon slipped from their grasp. Patong could have put the innings to bed at 130 had they held even later catching opportunities, in particular that of Chris Gordon who was dropped on 10. However, the tail-end not only wagged, but thrashed like a crocodile’s in a feeding frenzy, with young Gordon racing to 32 off 38 balls. Craig Patterson (11) was dropped when on 2, but recovered, and with Mark Ashman (9 not out) they both got in on the buffet to help reach a score of 172 by the end of the 37th over. Raju topped the Patong bowling figures with 3 for 36, while Jhagta took 2 for 30 and Naresh posted 2 for 32. Slightly demoralized, Patong very soon slipped into despair when the top order collapsed for just 17 runs with Patterson and Mydeen bagging a brace each in under 20 minutes from the start of the Patong innings. Sadarangani (15), Rawat (27) and Folds (22) hinted at a recovery, but Patterson and this time White, combined to send Patong’s hopes plummeting to a resignation of defeat. The Village tail-end being compared to voracious predators, Patong’s lower order would have take the role of helpless prey such as waterfowl, with Noble, Jhagta and Naresh all recording ducks and Patong capitulating on 90 runs all out. Patong’s misery ended in the 23rd over with Patterson claiming six wickets and only 17 runs conceded, his wild celebrations reflecting the importance of his contribution to the team’s win. The Village’s 82 run victory over Patong now sees them at the top of the table with a four from four winning streak. For more information on cricket visit phuketcricketgroup.com.